There is no need to buy expensive toys....my daughter finds joy in the simplest things.... plastic cups ! We began building with plastic cups about 2 years ago and it has always been a huge hit! Even friends that come over have played with these cups. I have found them being built with, colored on, jumped over, filled with water, used as cones for riding around, and more! These cups have probably gotten more use than any other disposable cup! 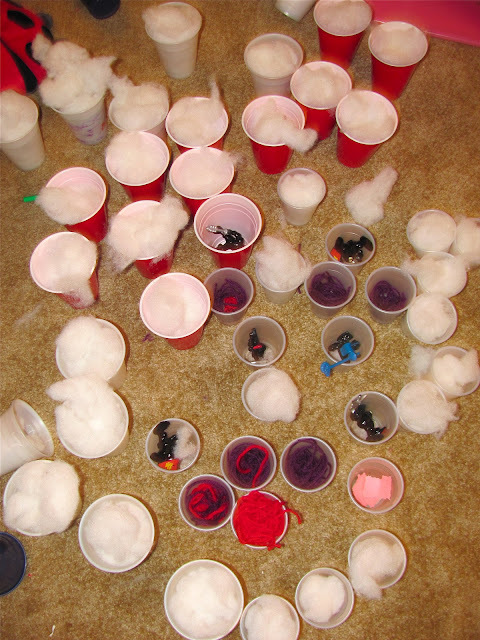 Here are some cup sculptures filling our whole living room! More building with cups... you can see we have a great number of cups to play with....maybe that is the secret to why they are played with? Then one day when we were stuffing our Paper Bag Puffy Hearts with poly-fil stuffing, I noticed C was inventing her own play with these cups. She was filling them with toys, yarn, and poly-fil! This is what happens when you let kids play!!! I did not tell her to do this at all! Look at all that is going on here! What do you think my daughter was creating??? Like I said, "There is no need for expensive toys!" I guess we need to buy some more cups!!! I know we'll be creating more with cups in the future! Have your children been playing with cups? or anything else out of the ordinary? Maybe my daughter is on to something! 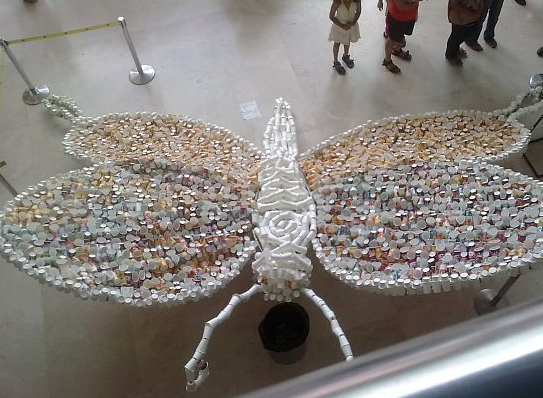 Look as this beautiful Butterfly Sculpture made out of Disposable cups from EcoFriend. 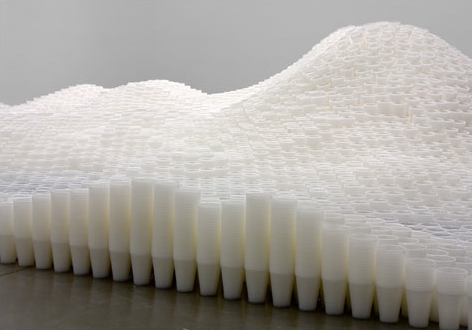 And look at this Cup Sculpture made by artist Tara Donovan from The Boston Phoenix. Just Beautiful! Thanks Scott! We plan to create more. I just love seeing the imagination that was brought to life from such simple materials. My older daughter loves to play with cups as well. She is only two, so for her,filling and dumping is the best thing ever . I agree! That is great that your older daughter is having fun with cups. Simple is always the best. You are right - simple materials are best. My daughter can play for a long time (not every day, of course) with popsicle sticks and bottle caps. This is a good post, and reminder that open ended objects are often best for creativity. Ane it's true that we don't need to provide expensive materials - children generally often prefer the simple everyday things. I'll need to remember this, and provide a collection of cups for my children. These artist's use of cups are beautiful! Hmmm...it will be interesting to see any creations you and Cassie think up with cups one day. 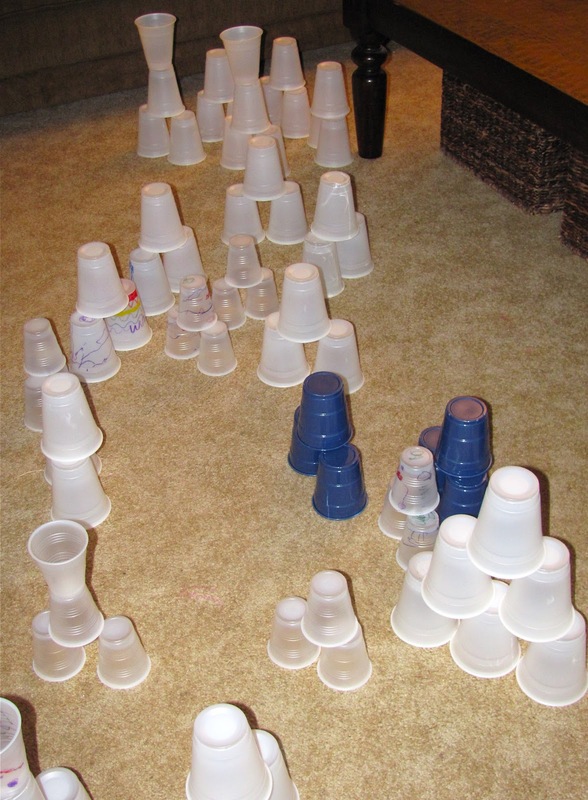 My grandparents did something similar to this for us grandkids when I was little- they had access to tons of unused coffee creamer cups (my aunt works for a restaurant supply company and looking back I'm sure they came from her)and there was a huge basket of them for us to build all sorts of castles and towers with them. These were used by a large range of ages of kids all at once and when I went back with my cousins a couple of years ago, we played with them again even tho we're in our 20's now. Thank you for reminding me of this! Experiment: How Is Frost Made?